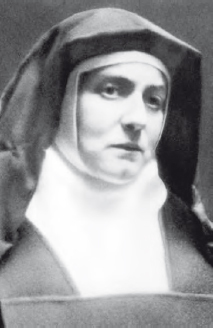 Edith Stein (1891–1942) was canonized by Pope John Paul II in 1998 as Saint Theresa Benedicta of the Cross. She was born into an observant Jewish family in the central European region of Silesia, which was then part of the German Empire. In 1932 she denounced the Nazi regime to Pope Pius XI. She converted to Roman Catholicism in 1922 and was received into the Discalced Carmelite Order in 1934. In a retaliatory move against Jewish converts in the Netherlands, where the Carmelites had sent Stein for safety, she and her sister Rosa were transported to the Auschwitz concentration camp. They died there in the gas chamber in 1942. Stein was a student of Edmund Husserl (1859–1938), first at Göttingen University and then at Freiburg, where she became his assistant. Her doctorate was “On the Problem of Empathy.” She became a faculty member at Freiberg University after working with Martin Heidegger in preparing Husserl’s manuscripts for publication. As a Jewish woman, she was barred from further postgraduate studies at Freiberg and other German universities. She finally gave up her assistantship to Husserl and began to teach in Catholic girls’ schools, learning about Thomas Aquinas (c. 1225–1274) and Catholic philosophy in general. She did become a lecturer at the Institute for Pedagogy at Münster, but had to give it up due to anti-Semitic laws in 1933, the same year that her former colleague, Martin Heidegger (1889–1976), was made rector of Freiburg University. The miracle Edith Stein is supposed to have performed—that of curing a child who had overdosed on acetaminophen in response to a prayer from relatives—is disputed by some Jewish groups who claim it is not clear whether she is a genuine martyr. Her legacy includes numerous writings, some of which were translated into English in the 1980s and 1990s: Life in a Jewish Family: Her Unfinished Autobiographical Account (1986), On the Problem of Empathy (1989), Essays on Women (1996), and The Hidden Life, (1993). Stein also wrote Knowledge and Faith, Finite and Eternal Being: An Attempt to an Ascent to the Meaning of Being, Philosophy of Psychology and the Humanities, Self-Portrait in Letters, which have not yet been translated into English or published. Edith Stein, a student of Edmund Husserl, was canonized after performing a miracle to save a child who overdosed on acetaminophen (AP).